Hiding and Seeking: Faith and Tolerance After the Holocaust | TURN OFF YOUR CELL PHONE! After watching the luke-warm rom-comThe Treatment during my “finish watching every film with Chris Eigeman” phase this summer I was reminded of that film’s director Oren Rudovsky. Rudovsky also directed the excellent A Life Apart: Hasidism in America, a wonderful and enlightening examination of a religious subculture that’s always seemed especially foreign to me as an outsider. 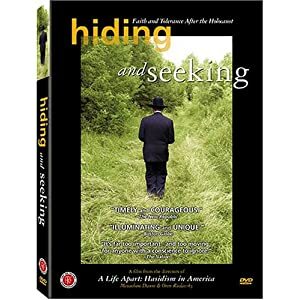 Reading more about Rudovsky was I directed to the 2004 documentary he co-directed, Hiding and Seeking: Faith and Tolerance After the Holocaust. Rudovsky’s filmmaking partner for this work was Menachem Daum. Daum, an Orthodox Jew whose beliefs have evolved a strongly humanistic bent, and his wife, both children of Holocaust survivors, endeavor to bring their two sons to Poland to discover the history of their parent’s WWII survival. Daum’s sons, Tzivi and Akiva, are Yeshiva scholars living in Jerusalem. Menachem fears that his sons have isolated themselves from the non-Jewish world and have developed an unhealthy distrust of Gentiles (something he attributes to the influence of his own father.) Menachem hopes this trip will be a sort of hajj for his two sons – he hopes it will open their minds to the Gentile world. He hopes they will understand that, were it not for the bravery of the Polish gentiles (the Mucha family) who risked their lives by hiding their grandfather and his two brothers for more than two years, they would never have been born. The film is shot in a very straight-forward journalistic/verite style, largely without accompanying music. Nonetheless the power of the experiences and the emotions that overwhelm them upon meeting and speaking to the suriviving members of the Polish gentile family who hid their grandfather is profound. The sons, who, early in the film are seen to scoff when their father stuffs a written prayer in the nook between a stone wall and a telephone poll at the location of a demolished synagogue, finally break down at the location of the Mucha’s barn that hid their grandfather from the Nazis more than 50 years ago. Crying they say a prayer with their mother – a prayer designated for places where miracles happen. This entry was posted on August 31, 2010 at 1:36 pm and is filed under Uncategorized. You can subscribe via RSS 2.0 feed to this post's comments. You can comment below, or link to this permanent URL from your own site.